This Thursday night July the 17th, the NLRA will try to take mother nature out of the win column and race at the Red River Co-op Speedway near Winnipeg, Manitoba, Canada. The race is scheduled to be the series' 23rd appearance at the four-tenths mile oval that sits five minutes south of Winnipeg on Highway 75. The NLRA's first event was held at the track when it was the Victory Lane Speedway in June 1998 with Howie Schill becoming the first winner in series history. Mike Balcaen, driver of the No. 10 Northstar Canada Victory Circle, is the defending track champion, and leads all drivers with five previous NLRA victories at the speedway. Brad Seng, driver of the No. 12S S&S Transport Mars MB Custom is the only other series regular to win in Winnipeg, with two previous victories. Current series runner-up Ricky Weiss is undefeated in weekly action in Winnipeg this season, as he has parked the No. 7 Derrick's Sandblasting machine in victory lane all four times that the late models have raced there this season. Joey Pederson, driver of the No. 7P Dahlstrom Motors Mars MB Custom, won last years' visit to Winnipeg. Pederson started seventh and took the lead from Paul Veert on lap eleven. Pederson lead the final 14 laps for his second series win in Winnipeg and seventh overall. Dustin Strand, driver of the No. 71S Q&Z Plumbing & Heating Millenium, Troy Schill, driver of the No. 11 Forks Finest Auto Body Rocket, Balcaen, and Brad Seng rounded out the top five. Paul Veert, who lead nine of the first ten laps finished sixth, while Steve Anderson, driver of the No. 9 Hi-Per-Flex Panel Systems Pierce ran seventh. Steffen Snare, driver of the No. 71 High Mark Snowmobile Rentals Bloomquist was eighth. Bill Mooney, driver of the No. 2 Lithia Toyota/Pizza Ranch Rocket and Cole Schill, driver of the No. 44 Rivinius Ranch Rocket rounded out the top ten. Seng picked up his second of three consecutive hard charger awards, passing seven cars during the main event. Brad Seng leads the NLRA point standings, with a 36 point advantage over Ricky Weiss. Pat Doar sits in the third spot, with Mike Balcaen and Dustin Strand trailing in fourth and fifth respectively. Shane Edginton in the No. 5E Avonlea Group entry holds the sixth spot, with five time World of Outlaws sprint car champion Donny Schatz sitting seventh. Dave Smith, in the No. 06 Mobil 1 Capital is eighth, while Bill Mooney and Cole Schill round out the top ten. On Saturday night the NLRA was scheduled to make-up their June 14th event at the Greenbush Race Park in Greenbush, MN, but a line on showers showed up at the track at six o'clock and dumped too much rain, causing a second cancellation of late model racing in Greenbush this season. Saturdays' race was the third consecutive series event to fall to rain, and the fifth rain out overall. NLRA series officials and the Greenbush Race Park are working to find a date and try a third time to race in Greenbush. 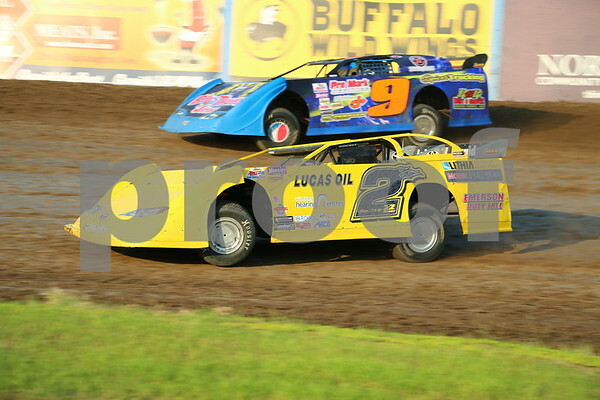 NLRA series regulars Bill Mooney (2) and Steve Anderson (9) racing at the River Cities Speedway on July 4th. Photo courtesy of Rick Rea.